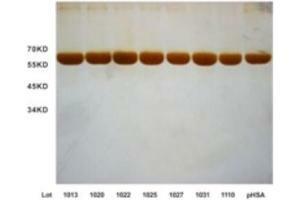 Comparison with commercial rHSA: Compared with the commercial rHSA, OsrHSA has no degraddation fragment and fewer polymers. 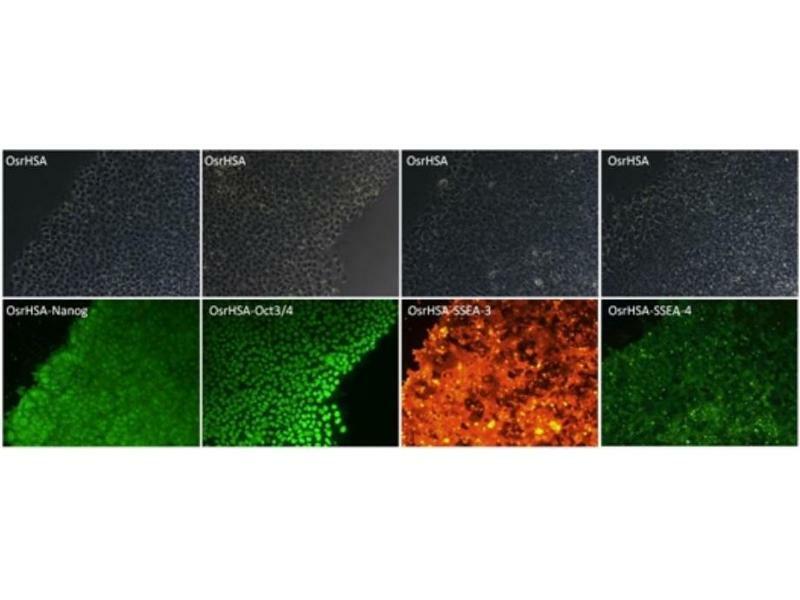 OsrHSA keeps iPS cells in an undifferentiated state: The immunofluorescent staining showed OsrHSA was effective in keeping undifferentiation and keeping viability of iPS cells. Performance of OsrHSA in promoting cell growth and antibody production: The promotion of cell growth was comparable to that of CHO cells on 10% FBS. 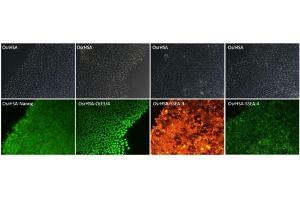 OsrHSA showed a 20% increase in maximum viability and density compared with pHSA in Vero cells. The titer of antibody (IgG1+κ) measured SP2/0 cells supplemented with OsrHSA was significantly higher than that supplemented with pHSA. Purity > 99.0 % as determined by: (a) Analysis by SEC-HPLC. (b) Analysis by SDS-PAGE. 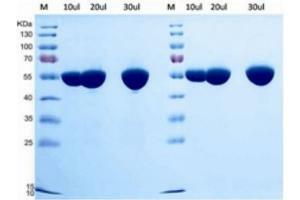 Background Human serum albumin is the most abundant protein in human plasma. It can transport hormones, lipids, and other molecules, buffer pH , and maintain osmotic pressure, among other functions. OsrHSA is a recombinant human serum albumin derived from rice grains, which provides an excellent solution for animal component free medium. Compared to FBS, pH SA and BSA, OsrHSA has a higher purity and better batch consistency in most cases. In the meanwhile, OsrHSA is also widely used as excipient, stabilizer and embedding agent in bio-pharmaceutical applications. Buffer OsrHSA is lyophilized with saline. Handling Advice Please avoid freeze-thaw cycles. Storage Comment Stored at temperatures 2-8℃ for 24 months. For lyophilized powder, it is recommended to reconstitute the lyophilized OsrHSA in sterile PBS. Upon reconstitution OsrHSA should be stored below -20℃. Use as soon as possible after opening. 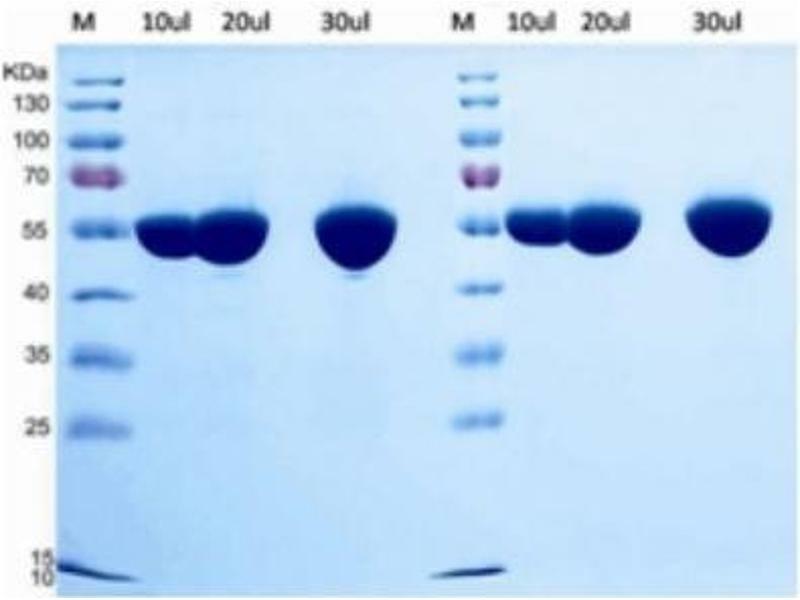 Product cited in: Chen, Dai, Liu, Zhang, Pang, Ou, Yang: "Quantitation of the residual DNA from rice-derived recombinant human serum albumin." in: Analytical biochemistry, Vol. 450, pp. 4-10, 2014 (PubMed). 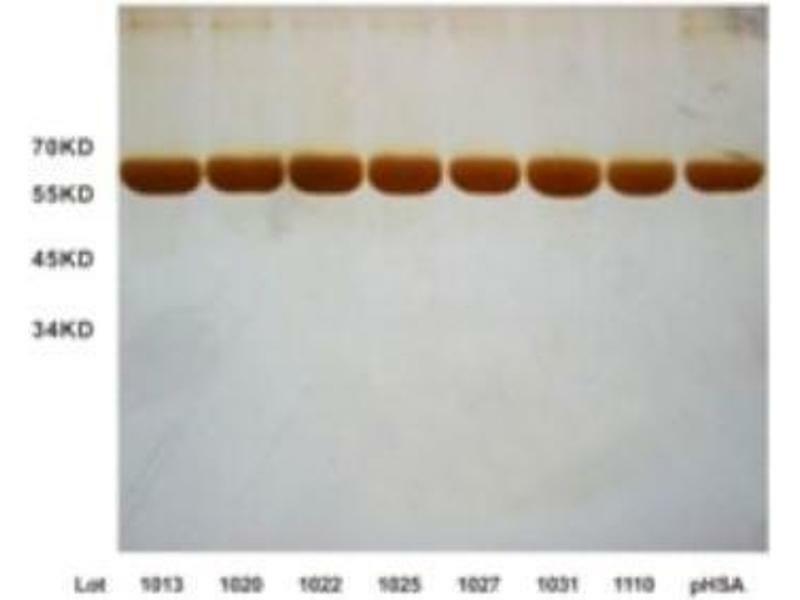 Fu, Cheng, Liu, Chen, Wang, Ruan, Zhou, Xiong, Xiao, Liu, Zhang, Yang: "Immunotoxicity assessment of rice-derived recombinant human serum albumin using human peripheral blood mononuclear cells." in: PLoS ONE, Vol. 9, Issue 8, pp. e104426, 2014 (PubMed). 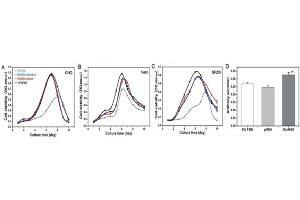 Frahm, Smith, Kane, Lorbetskie, Cyr, Girard, Johnston: "Determination of supplier-to-supplier and lot-to-lot variability in glycation of recombinant human serum albumin expressed in Oryza sativa." in: PLoS ONE, Vol. 9, Issue 10, pp. e109893, 2014 (PubMed). He, Ning, Xie, Qiu, Zhang, Sun, Jiang, Fu, Yin, Zhang, Shen, Wang, Li, Lin, Sun, Li, Zhu, Yang: "Large-scale production of functional human serum albumin from transgenic rice seeds." in: Proceedings of the National Academy of Sciences of the United States of America, Vol. 108, Issue 47, pp. 19078-83, 2011 (PubMed).